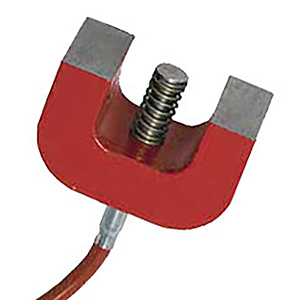 Omega’s magnetic-mount temperature sensors are available with a wide range of lead wire insulations and terminations. See the Part Number Builder below for a list of cables and their maximum operating temperatures. Use the Ordering Guide to specify a sensor for your requirements. Note: Magnetic sensors are available with a variety of cables at the same price for the initial 1 meter (40 inches) of cable. For a list of the other cable options, and ordering information, see the Part Number Builder below. For cable lengths greater than 1 meter (40"), change cable length (in meters) in the model number to the required length and add the following price per meter (40"): $1.50 per meter of PVC; $3.00 per meter of silicone; $3.50 per meter PFA; $5.75 per meter of fiberglass; $6.40 per meter of SST braided fiberglass; $2.10 per meter of braided PVC; $4.40 per meter of SST braided PFA cable. To add a connector termination, add $7 for “OTP” or “MTP” connectors or $17 for TA3F connector (3-wire) and $17 for a TA4F connector (4-Wire). For sensors with TA3F or TA4F connectors, please specify wiring requirements with the order.